A birth chart provides you a clear picture of your personality, positive traits, negative traits, milestones, challenges, good and bad phase and much more. Your birth chart or natal chart, as it is also known as, is prepared by way of your date of birth, place of birth and time of birth. If you do not know your birth time, then there might be some aspects you might not know about, but still, there is a lot you can discover about your life. An Astrology birth chart plays a significant role in determining Birth Chart Compatibility between two individuals as well. What are the different aspects of the Birth Chart? A birth chart is basically prepared on the basis of 2 aspects - Planets and Houses. There are planets and stars which affect human lives considerably which are the Sun, the Moon, Venus, Mercury, Mars, Jupiter, Saturn, Uranus, Neptune, and Pluto. Then, a birth chart is segmented into 12 different houses, with each house depicting an integral area of one’ life. And then there are 12 Zodiac Signs which in a way influences the effect a planet can have on an individual’s life. How to read & analyse birth chart?? 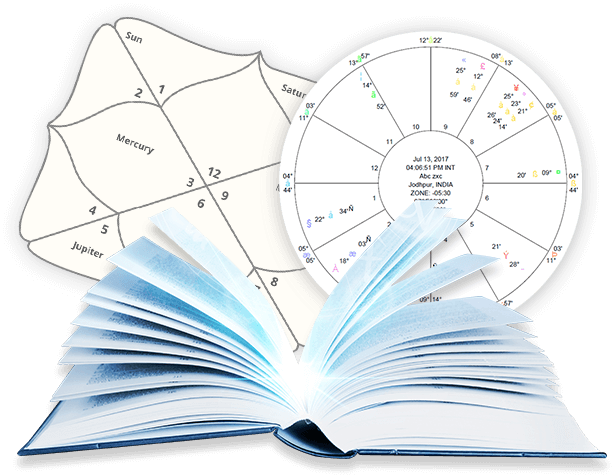 The preparation of a birth chart wheel requires a lot of calculations and birth chart interpretations. It can be done by only who have in-depth knowledge about the planets and their movement and the houses, i.e. an expert Astrologer. However, there are certain basic things one can understand. Firstly the planets are categorized into two parts - inner planets and outer planets. Inner planets are the planets with short orbits and they move around a Zodiac quite frequently. These planets define our personality traits and also affect our routine experiences. They include- Mercury, Venus, Mars, Sun, and Moon. Outer planets are the ones with longer orbits. They move at a slow pace and are indicative of the larger picture of life. These planets are Saturn, Jupiter, Uranus, Neptune, and Pluto. The second significant aspect is Houses. The importance of the outer planets lies in the houses they are positioned in. A birth chart is divided into 12 houses. Each house caters to a different aspect of life. The first 6 houses signify the routine activities in day to day life and everyday matters such as home, money, etc. Whereas the last 6 houses throw light on the general philosophy of life and its effect on you. These planets and Zodiac signs are placed in different houses which enables the Astrologer to make accurate birth chart interpretations about an individual’s personality and life. Astrology Desk is the best site for Birth Chart interpretations. We have a team of experienced Astrologers and psychic experts who carefully study each and every detail of your birth chart to provide you with Free Astrology Report. Get your Free Birth Chart Horoscope now!